Featuring quilt displays, craft items and some quilts for sale. Join many other hexagon lovers at the Powerhouse Museum to pour over antique hexagon quilts, be enthralled by the many modern interpretations of the hexagon and to learn more. 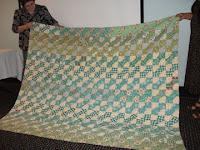 We hope to have several quilts from well-known quilt makers for you to see up close. This event organised by the Quilt Study Group (part of The Quilters' Guild of NSW Inc.) will be held in the Powerhouse Learning Centre on Saturday 24th April 2010 from 2pm to 4pm. If you contact the event owner, Sandra Lyons on 9589 2537 beforehand it is possible to arrange for car parking in the Powerhouse's parking area for disabled drivers. Or you can use the drop off area near the entrance to the car park which provides easy access to Level 2 where our events are held. Are you a current member of the Quilters Guild of NSW? Do you keep a blog with a focus on quiltmaking and other creative endeavours? If so, you are welcome to send a request to the Guild Webmaster for your blog to be added to the Member Blog Roll that can be found in the sidebar of this blog and on the Cyberspace links page on the Guild website. The webmaster will be updating these listings shortly. Textile artist Dorothy Caldwell speaks at the College of Fine Arts in Sydney - Out of the Ordinary: Textiles in the Everyday. One of the wonderful qualities of cloth is that it wears out, breaks down and is continuously being re-made into something new. Stitching, mending and patching create a surface of unintended beauty and the sense of “lives lived”. It is from these ordinary practices that Dorothy Caldwell has developed the vocabulary of marks that she uses in the making of her large fabric constructions. The talk will address this aspect of traditional textiles and how it has been used as a basis for Caldwell’s work. Dorothy Caldwell is a graduate of Tyler School of Art in Philadelphia and maintains an active international exhibition and teaching schedule. She has carried out research in Japan, India, and Australia on textile traditions and is the recipient of grants and awards including the prestigious Bronfman Award given to one Canadian craftsperson each year. Her work is included in many permanent collections including the American Museum of Art and Design, Canadian Museum of Civilization, The Carlton and Reta Lewis Collection in Washington D.C., The Canadian Consulate Bangkok Thailand, and the International Quilt Museum and Study Center University of Nebraska. Dorothy is visiting Australia at the invitation of The Australian Forum for Textile Arts and teaching at their Orange Forum (NSW) in April. Do you teach Patchwork and Quilting? Are you interested in becoming an accredited teacher with The Quilters' Guild of NSW Inc? Come and join the members of the Teacher Accreditation sub-committee and some accredited teachers at the Guild office on Saturday 8th May 2010. This is an excellent opportunity to find out more about the process of becoming an accredited teacher, to ask questions and to share any concerns you may have about the program in an informal gathering. Time: 10am to 4pm. A sandwich lunch will be provided. Cost $10. Bookings are essential. 289 entries from over 200 individual and group members have been received for the 2010 Sydney Quilt Show. ALL valid entries have been accepted. Formal acceptance letters with important details about the delivery of your quilts will be posted out at the beginning of May. In the meantime, keep on putting the finishing details on your quilts. We look forward to a great show! The New Quilt 2010 will take place at the Manly Art Gallery and Museum from 18 June until 25 July 2010 and there will be a colour catalogue generously sponsored by Brother International Australia. 1000 Artisan Textiles features artisan-made examples of quilts, wall hangings, linens, rugs, baskets, wearable art, home accessories, and fashion accessories; incorporating a number of techniques including felting, hand and machine embroidery, appliqué, dyeing and fabric painting, weaving, beading, and all types of surface decoration. 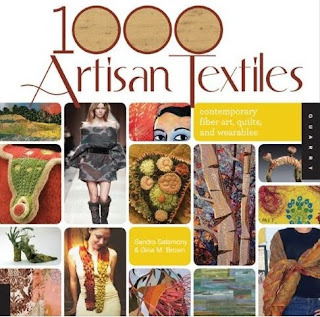 Other Australian textile artists featured in the book include: Elizabeth Armstrong, Gill Brooks, Heather Crossley, Ruth deVos, Penny Eamer, Jette Ford, Jody Pearl Lange, Carol McGill, Sharron Shalekoff, Tricia Smout, Svenja and Daniela Tommasi. The annual "away" or country meeting is tomorrow 10 April 2010, 1.30pm at the ARCC Hall, Tarcutta Street, Wagga Wagga. Judy Hall from Punch with Judy is the guest speaker and there will be a HUGE Show & Tell event. All welcome! 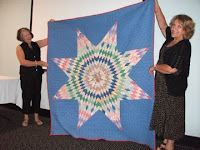 On the 27th February 2010 at the Powerhouse Museum, Jennie Burton gave the Quilt Study Group of NSW members and friends a 30 minute talk about 1930s quilts. 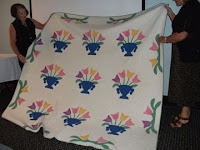 She brought along some 1930s quilts, quilt tops and feed sacks from her collection for us to see. She told us that she is drawn to these quilts for their colourful scrappiness and put the making of these quilts into historical perspective, referring to the influence of the depression years of the 1930s, changes in fabric dyes, the mass production of bed coverings and then the revival of quilt making between the wars. During the Depre ssion the number of advertisements, patterns and articles about quilts in newspapers increased so that many women had scrapbooks containing planned quilts (not dissimilar to us now). Popular patterns included the Dresden Plate, Butterfly, Grandmother’s Flower Garden, Sunbonnet Sue, and Double Wedding Ring because they all involved using up fabric scraps. “Use up, wear out, make do or do without” was the motto for these women. Quilting in the 1930s also provided a way for some to make money by designing quilt patterns, making and selling quilts and quilt kits and by winning prizes at quilt shows. Quilts were also a softer side of the Great Depression and the importance of sewing and quilting bees took the quilters’ minds off their troubles. The feed sacks, which provided cheap fabric for the 1930s quilts, were originally made from plain calico and were hand sewn by the farmers with hand written labels. Later they were sewn by machine and had pre-printed labels that had to be soaked off in order to use them. The feed sack bag and sack manufacturers then came up with the idea of using patterned fabrics thus leading to their use in making curtains, dresses, quilts and even underwear. The finer grades of feed sacks were used for holding sugar or flour, the coarser ones for corn or chicken feed. Now they are discovering whole attics full of feed sacks which are coming onto the market. Jennie then showed us some American feed sacks which prompted Annette Gero to show us her Australian feed sack. Among the many wonderful quilts from Jennie’s collection we saw one unusual quilt with black baskets, another with a yellow background and a vibrant ‘Trip Around the World’ quilt with such perfectly matching fabric that she believes it could only have been from a quilt kit. The Royal Agricultural Society of NSW and the Quilters' Guild of NSW Inc are showcasing patchwork and quilting as the feature display in the Arts Pavillion at the 2010 Royal Easter Show. In addition to the quilts entered in the show, there will be a display in the centre of the pavillion and demonstrations of different quilting techniques. The Royal Easter Show continues until Wednesday 14 April 2010. Come along and say hello! Congratulations to Guild member Lisa Walton who has been awarded the Jewel Pearce Patterson International Quilt Teacher Scholarship, Houston, USA for 2010. Jewel Pearce Patterson was one of the founders of Quilts, Inc. and the mother of Karey Bresenhan who is the current president of this organization. Quilts Inc. sponsors three major quilt festivals and two quilt markets each year. In 1990, this organization developed a scholarship for quilting teachers and one teacher is chosen for this prestigious award. This year is even more special as it would have been the 100th birthday of Jewel Patterson and Lisa feels especially honoured. The scholarship covers airfare and accommodation and a full program of workshops at the 2010 Houston Quilt Market and Festival and is an opportunity of a lifetime. In 2011 Lisa will be required to mount an exhibition of her work and that of her students at the Houston Quilt Festival and it also travels to the other Festivals. What an extraordinary opportunity to show her work to so many people. Australia’s history is retold through patchwork quilts in this exhibition drawn from national, state and private collections. The fabric scraps, patterns and needlework conjure memories of past times and allow an examination of the social histories of countless ordinary and some extraordinary people which would otherwise never have been told—Governor’s wives, wealthy shop owners, farmer’s wives, gold rush immigrants, prisoners of war, and all the mums that made their children’s clothes and never threw anything away. 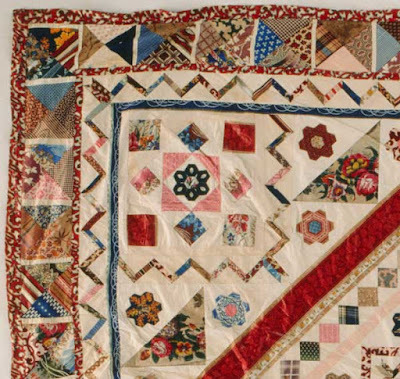 This exhibition includes rare and unique quilts displayed with contextual photographs and period furniture and has been curated exclusively for the Ipswich Art Gallery by Australian Quilt Historian Dr Annette Gero.